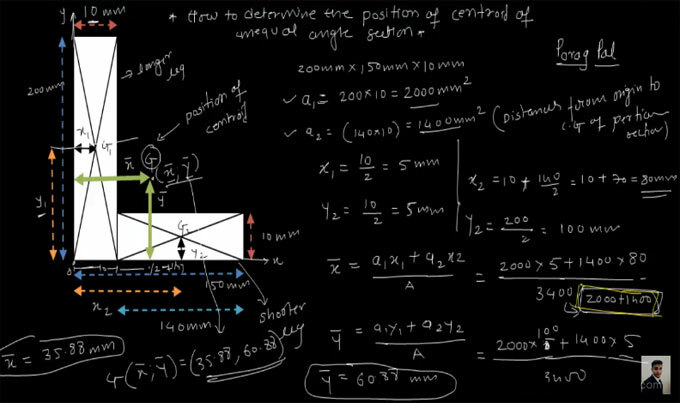 The centroid alias center of mass of beam sections is essential for beam analysis as soon as the moment of inertia is necessary for computing shear/bending stress and deflection. Beam sections are generally developed with one or more shapes. In order to determine the centroid of a complete beam section area, it should be divided into proper segments. After that, the area and centroid of each individual section should be taken into consideration considered to obtain the centroid of the entire section. This construction video tutorial provides the detailed guidelines to find out the point of centroid concerning irregular angle section. The dimension of the angle section is 200 mm x 150 mm x 10 mm. In the example given in the video, you have to find out the G point of the angle section that is demonstrated as x bar and y bar and as a position of centroid. Here, longer leg of the angle section is vertical and shorter leg is horizontal.